MailWasher is an easy way to check and manage your emails before you download them. It is a powerful email checker with effective spam elimination. Discover the safe way to stop unwanted viruses and emails before they get to your computer. It is so easy to set up and use that you'll be managing your email like a pro in seconds. It can even be used as an effective privacy tool. The Free version is limited to one email address. There are some really dumb comments here from people who clearly don't know what the program does. I've used it for years and it's very good at doing what it says on the box... Just read the box first. 1) Not everyone likes and uses webmail. 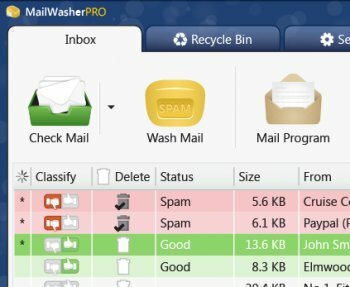 2) MailWasher allows the user to deal with (delete) spam and unwanted email at the server, so it is never downloaded to the computer. MailWasher is a terrific spam/email manager. Quickly and easily preview emails held on the server with one click. Mark any unwanted emails for deletion then one click to view the remainder through your email client. Spam never gets near your machine....too easy!! Um, ok. So this program get all my mail first, lets me look at all the spam and all the messages, delete them if I choose. THEN I have to open my email program and get the messages again? This is a strange way of dealing with email, seems like it would be a much slower process. I would just switch my email client to Thunderbird, train the spam filter by showing it spam and non-spam messages, (no one trains their filter which is why most of them fail) and that would take care of it in a single program. I get gobs of spam with my Gmail account and Gmail picks them up, where as Mail washer couldn't recognize a single spam email. Not impressed at all. MailWasher is an excellent program. I've been using it for a very long time. Pfurri, you gave the free version of the app a rating of 1 because it doesn't support multiple accounts? How lame is that? The Pro version supports multiple accounts. Forget it, just 1 account possible !!! Spam is every where. I don't care if you're a blue frog member, or a MSAS member. You are not gonna defeat it. This program is better then both of those programs. Another one of my favorites is spamhibulator. Either of these programs do what they say. This program i would rate up there with SH. Awesome program! It's free, and it does what it says. stick with version 2.0.28 beta, as that version works 100%, and has all the features. this new version is crippleware. First time I've used this program. It Rokz. Installation was good, no problems. No runtime errors. It bounces emails well for me. Considering I am running several types of email accounts, it works well. Why is this program so much faster with Hotmail then Outlook Express? That says a lot for MailWasher, and little for Outlook Express. Microsoft could learn some lessons from this program! I've been using mailwasher for a long time, it just keeps getting better. I have about 30 email accounts, it checks them all really fast, and is really good at finding spam. For downloading large amounts of mail this program might have its uses but I feel that it is very much over-rated. Programs of this type are pretty much useless or cumbersome when downloading single emails at frequent intervals. There are better programs although I suppose people should use what ever works for them depending on how much mail they receive and how often they download it.